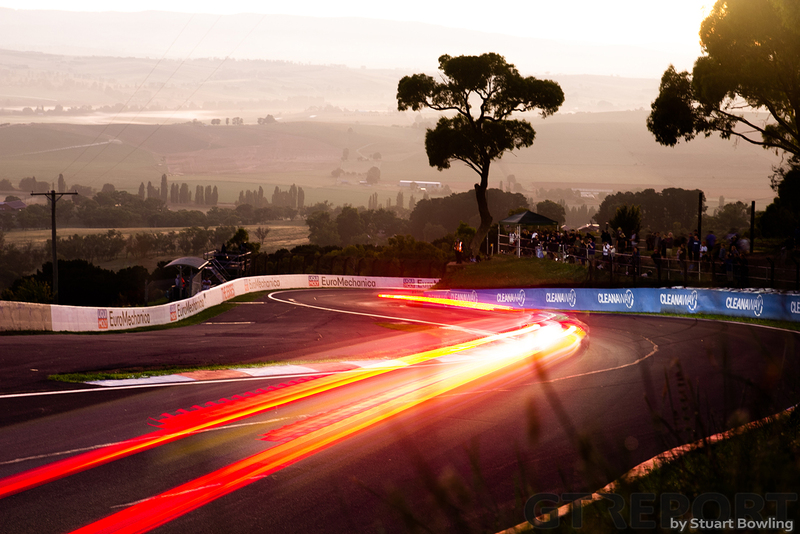 Welcome to the Bathurst 12 Hour. 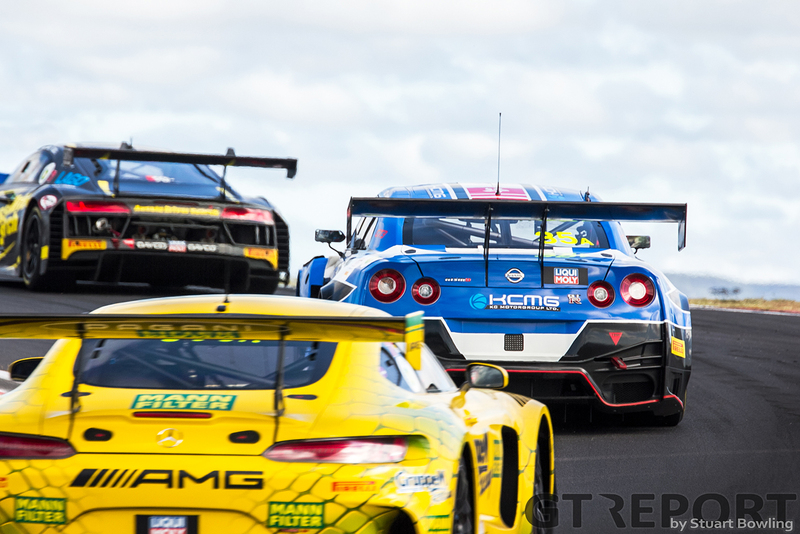 Today, a field of 38 cars will battle for the Australian Tourist Trophy at Mount Panorama. Lining up the grid under a pitch black sky and taking the green at 5:45 local time, the drivers will race into the morning and through the afternoon in the opening round of the 2019 Intercontinental GT Challenge. 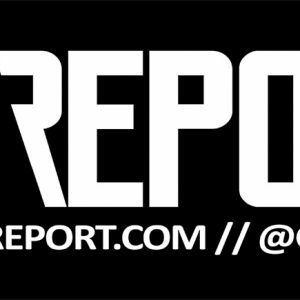 Follow the race with regular updates and photos here at GT REPORT with our live blog. 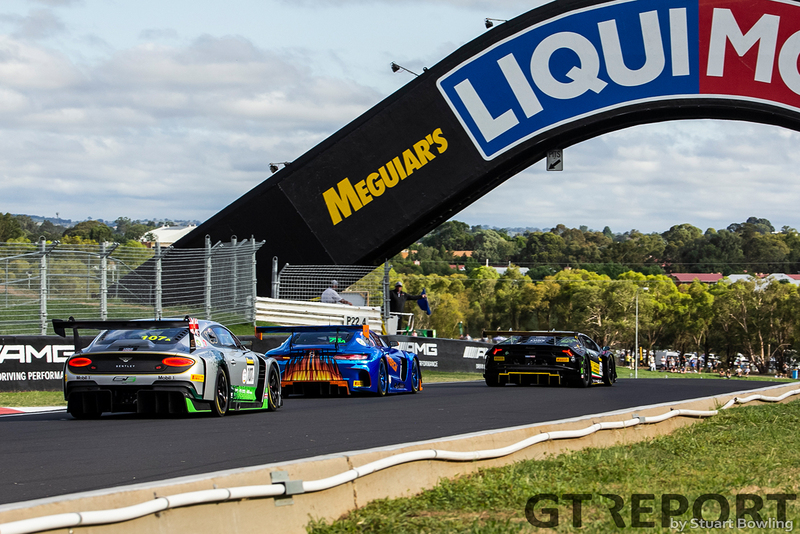 With the rumble of a 38-car strong field awakening the town of Bathurst, Maximilian Buhk led the way to the green flag. 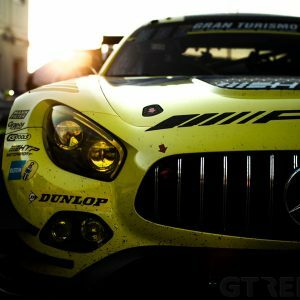 The German racer had nothing but the bright headlights of his number 999 Mercedes-AMG Team GruppeM Racing Mercedes-AMG GT3 to reveal the road in front of him has he raced towards the first glimpses of twilight. In his rear view mirror the blinding headlights of Luca Stolz’ number 77 Craft-Bamboo Racing/Black Falcon Mercedes-AMG GT3 chased him at every turn. 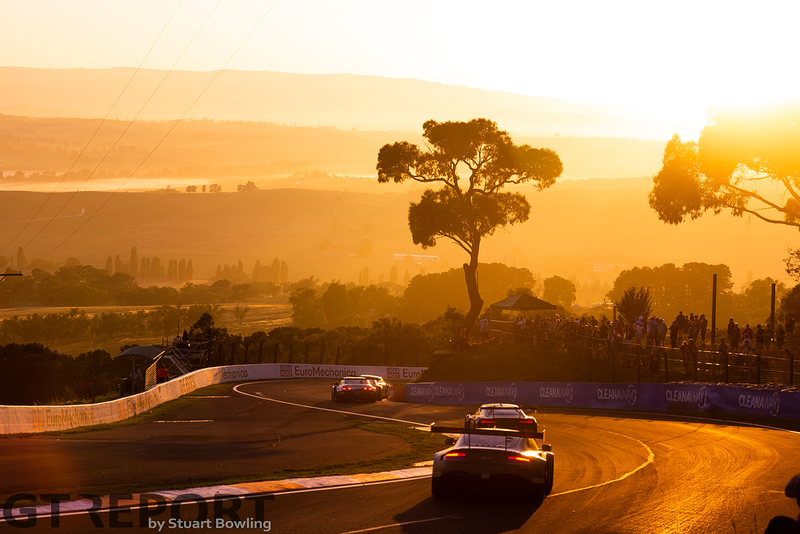 As the sun began to rise over Mount Panorama, a remarkably calm opening hour followed. Stolz chased Buhk towards the first pit stops of the day but didn’t mount an attack. Behind the AMG duo, Steven Kane in the number 107 Bentley Team M-Sport Continental GT3 circled a handful of seconds behind in third place. At the first round of pitstops Stolz managed to jump Buhk. Coming in a lap earlier, the young German made the most of his outlap to stick it just in front of Buhk as the Yellow Mamba exited pit lane. The long green flag racing came to an end after an hour and a half when the first major crash of the day happened. 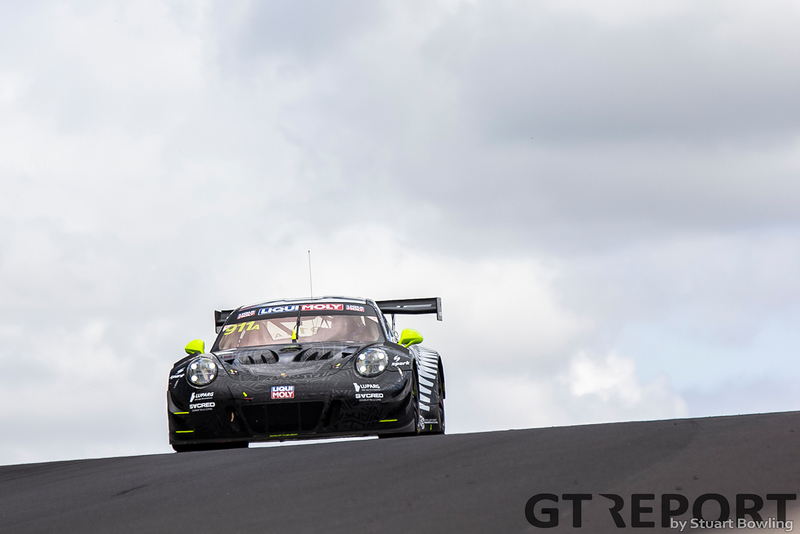 Coming out of The Grate, David Calvert-Jones lost the rear of the number 12 Competition Motorsports/McElrea Racing Porsche 991 GT3R and slid backwards into the wall, ending the Ice Break-sponsored Porsche’s Bathurst 12 Hour. Going back to green, Stolz, Buhk and Kane speared off towards Griffins Bend. An attempted attack by the Bentley driver was fend off by Buhk, but allowed Vincent Abril – in fourth place after successfully defeating number 19 Nineteen Corp Black Falcon Mercedes-AMG GT3 driver Yelmer Buurman in a fierce battle earlier in the race – in the sister number 108 Bentley Team M-Sport Continental GT3 to catch up to the leading trio. 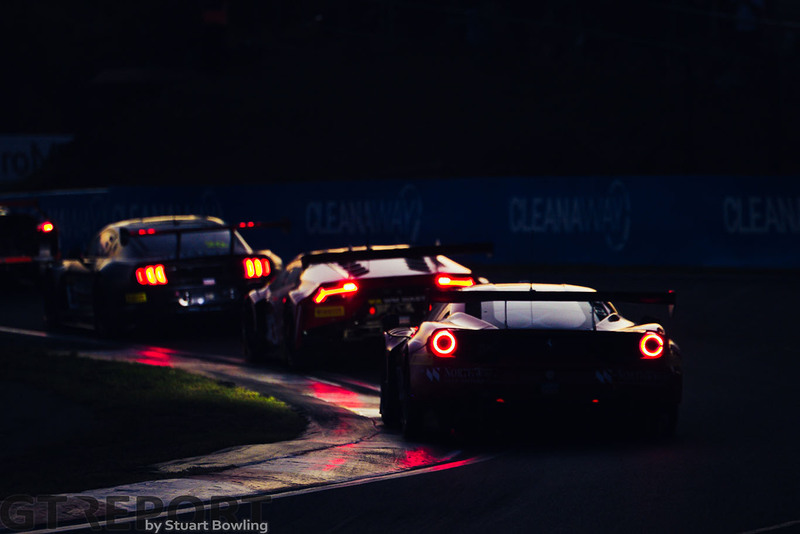 As the end of the second hour approached, drama struck again when 13th-placed Nick Percat in the number 27 HubAuto Corsa Ferrari 488 GT3 came together with the number 96 MARC Cars Australia Focus V8 of Mathijs Bakker in Forrest’s Elbow, ending the race for the Focus and sending the Ferrari into the garage for a long repair. What Kane failed to do half an hour ago, he did successfully at the next restart: Zooming past Buhk on Mountain Straight. A chance to strike back was taken from Buhk when the yellow flag was once again waved for the stranded number 760 R-Motorsport Aston Martin Vantage GT3 of Andreas Baenzige, who had smacked the wall at the short straight between The Chase and Murray’s Corner. The extended caution period was the first chance for teams to embark on a different fuel strategy. Both Bentleys and Buhk decided to come in for a drivers’ change and servicing, while Craft-Bamboo/Black Falcon decided to keep Stolz turning laps. Andy Soucek, having replaced Abril in the number 108 Bentley, left the pits only to come to a standstill at the exit. The Spaniard pushed the wrong button to release the pit speed limiter, instead pressing the car’s kill switch. 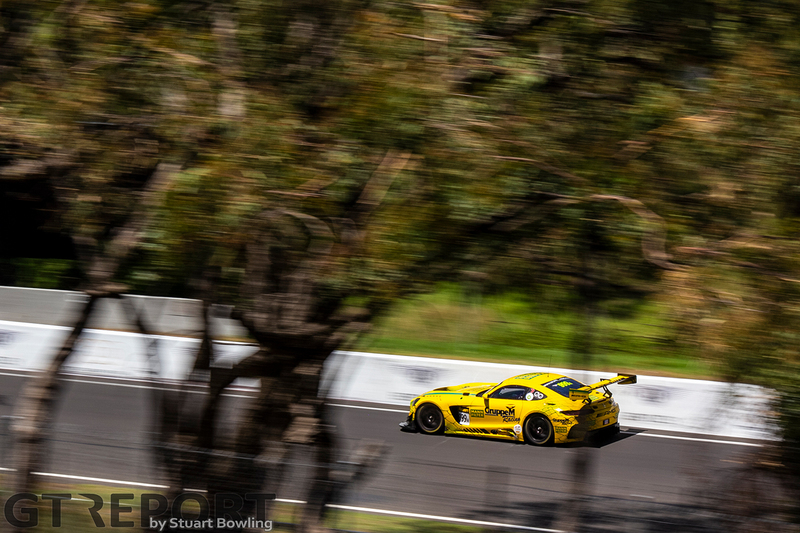 It wasn’t long before the Craft-Bamboo/Black Falcon AMG made its second stop of the day, however, when a damaged tyre forced the AMG into the pits. This allowed Stolz to end his sunrise stint and hand the car over to Gary Paffett. 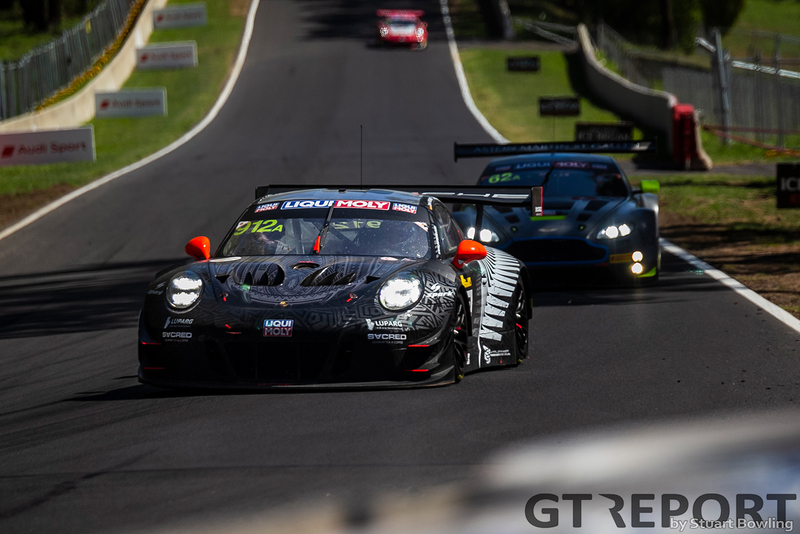 When the race finally got back underway properly, a street fight emerged between Craig Lowndes (number 888 Triple Eight/STM Mercedes-AMG GT3) and Martin Tomczyk (number 42 BMW Team Schnitzer M6 GT3) that lasted for laps, with Kelvin van der Linde (number 22 Audi Sport Team Valvoline R8 LMS GT3) acting the onlooker – but ready to strike. The battle was, for the moment, decided in favour of Lowndes. 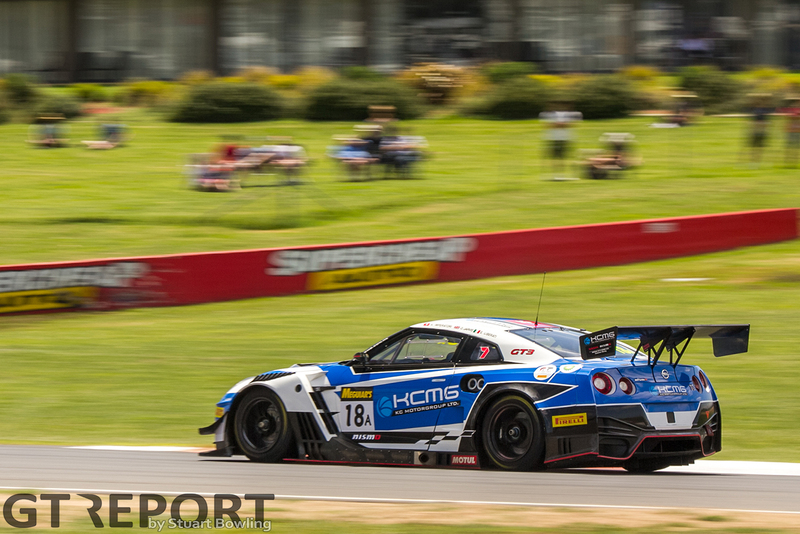 The Bathurst 12 Hour entered the fourth hour with Tomczyk leading. The BMW cycled into the lead as cars in front of him, such as the momentarily leading number 2 Audi Sport Team Valvoline R8 LMS GT3 of Christopher Haase and his earlier rival Lowndes, went for their third pitstop. The calm that marked the first hour of the race returned during the fourth hour. The number 77 Craft-Bamboo/Black Falcon AMG driven by Gary Paffett found itself back in the lead as teams cycled through the pitstops, switching places at the head of the field with the number 42 Schnitzer BMW of Augusto Farfus who had opted for a different pit stop strategy. KCMG had begun its race with the number 35 Nissan GT-R NISMO GT3 from 16th place on the grid. Quietly moving up the order, Tsugio Matsuda suddenly closed in on leader Farfus at the start of the fifth hour. After a short scrimmage with the Brazilian ace, Matsuda managed to shoot past the BMW on the long straight at the foot of the mountain to grab the lead. 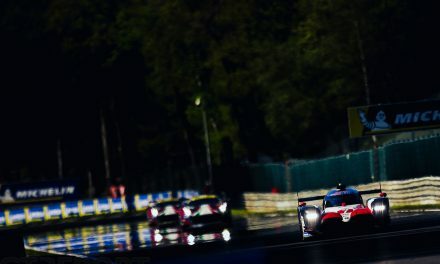 Matsuda’s moment in the limelight lasted a handful of laps before he entered the pits for a planned pitstop and change of drivers, handing first place back to BMW Team Schnitzer. As the temperatures began to rise, so did the action on track. A leading group of cars from P2 through P7 were running nose to tail, separated by only seconds, at the start of the fifth hour. The number 62 R-Motorsport Aston Martin Vantage GT3 of Matthieu Vaxivière led the six pack when the group encountered the number 19 Team Nineteen Corp Black Falcon Mercedes-AMG GT3 with Christina Nielsen behind the wheel that had just come out of the pits after a long repair. In the narrow corridors up the mountain, Nielsen moved over to let Vaxivière pass, but there was no room for Garth Tander in the number 22 Audi Sport Team Valvoline R8 LMS GT3 to do the same. The experienced Supercars racer misjudged the moment and crashed into the back of the Mercedes, leaving significant damage to both cars. Approaching the 5-hour mark, the number 35 KCMG Nissan driven by Josh Burdon ground to a halt on Mountain Straight before speeding back up again and continuing in 13th place. At the same time a piece of debris elsewhere on track made the race director decide to call for a Full Course Yellow. It wasn’t the end of the car’s troubles: Not much later the Australian steered his GT-R into the garage after experiencing more problems with the car. The pause in processions allowed teams to come in for their next pitstop, bring the majority of the field back on the same strategy with the number 2 Audi of Christopher Mies and number 62 R-Motorsport Aston Martin with Jake Dennis the only frontrunners to stay out. Another Full Course Yellow followed with 6 and a half hours to go when the Danny Stutterd-driven number 43 Ashely Seward Motorsport Porsche 991 GT3 Cup got caught out in the marbles at Frog Hollow while being lapped and crashed into the wall. 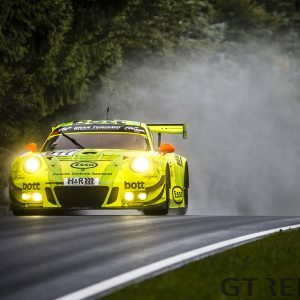 Again the restart proved to be a source of spectacle: In an attempt to retake the lead, Maximilian Buhk attacked Farfus who wasn’t going to roll over for the GruppeM AMG driver, both cars rubbing doors and not giving in on the long Mountain Straight. Buhk yielded, and then was slapped with a drive-through penalty for weaving at the restart – a big no-no at the Bathurst 12 Hour. 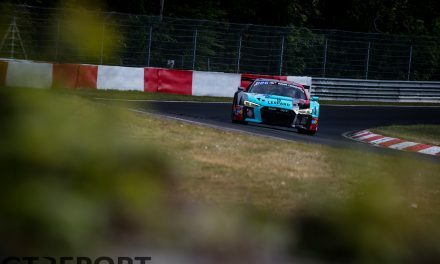 A new threat for the BMW of Farfus came in the form of Maxime Soulet’s number 108 Bentley, who overtook the aggressively defending Buhk for second place and then set his sights on the lead. The Frenchman soon found the back of the BMW and after unsuccessfully challenging Farfus’ lead, sat back to follow at some distance. As the race crossed the halfway mark, BMW Team Schnitzer (Farfus/Tomczyk/Mostert) is leading with the 108 Bentley (Soulet/Soucek/Abril) half a second back. R-Motorsport Aston Martin (Dennis/Vaxivière/Kirchhöfer) runs in 3rd place, 4 seconds back, just in front of a small group of cars. Going into the second half of the race, BMW Team Schnitzer finally yielded the lead when Augusto Farfus came in for his next pitstop and hand over the M6 to Martin Tomczyk. This gave the out-of-sync R-Motorsport Aston Martin of Jake Dennis the lead until the next yellow, joining the majority-pit window at the next Safety Car situation. While race-long contenders number 108 Bentley (Vincent Abril) and 77 Craft-Bamboo/Black Falcon (Gary Paffett) were still at the front in third and fourth place, the number 912 Earl Bamber Motorsport Porsche 991 GT3R (Dennis Olsen) had now joined the front-end of the field in second place. Matthieu Vaxivière was appointed the stint for the seventh and eighth hour in the R-Motorsport Aston Martin, holding off the stalking Abril for a short while before letting the eager Bentley driver by to have the lead at the start of the eighth hour. Abril’s determination to take charge of the race was explained in the laps that followed: Within a few laps he had already opened up a 10-plus second gap with a blistering pace. Double trouble for the double numbers with 4 and a half hours to go: Just as Gary Paffett parked his number 77 Craft-Bamboo Racing/Black Falcon Mercedes-AMG GT3 on the side of the track with smoke coming from the AMG engine, Fred Vervisch in the 22 Audi Sport Team Valvoline R8 LMS GT3 went off through the gravel at the high-speed McPhillamy Park and grazed the tyre barriers. The suspension damage was immediately obvious for Vervisch, who decided to park at the escape road in The Esses. 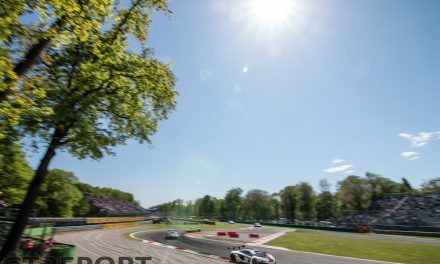 The caution that followed set off a mass excursion into the pits out of which both Earl Bamber Motorsport Porsche 991 GT3Rs emerged in the lead; Sven Müller in the number 911 leading team-mate Dennis Olsen in the number 912. The duo went to the front as a result of short-fueling. KCMG might’ve lost the number 35 Nissan GT-R NISMO GT3 as its strongest weapon, it still had the number 18 in the race and with Alexandre Imperatori behind the wheel the Asian team returned to contention as Imperatori relegated Olsen back to third place. 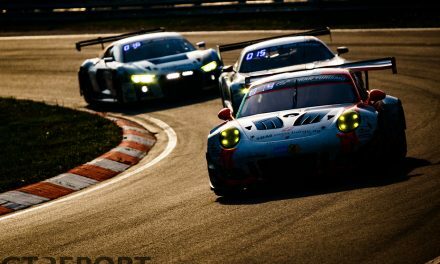 Although Imperatori closed in on Müller, it wasn’t until the Porsche dived into the pits that KCMG took back the lead for the first time since the morning hours when Matsuda went P1 in the sister GT-R.
Another blow was dealt to the number 999 GruppeM Mercedes-AMG GT3 with 4 hours to go. Overtaking under yellow earned the ‘triple 9’ the ire of the stewards and a drive-through penalty – the team’s second penalty of the race. Bentley, too, was handed a drive-through penalty for overtaking at the restart before the line by the number 108 Bentley, dropping the Continental several places down the order. With the final leg of 3 hours beginning, the number 911 Earl Bamber Motorsport Porsche (Mathieu Jaminet) and number 912 sister Porsche (Matt Campbell) returned to the lead, but on a significantly different fuel strategy than the third-placed number 62 R-Motorsport Aston Martin Vantage GT3 (Marvin Kirchhöfer), KCMG Nissan GT-R (Edoardo Liberato) in fourth, and BMW Team Schnitzer M6 GT3 (Martin Tomczyk) in fifth. Just past the 9-hour mark, Mathieu Jaminet brought his number 911 Porsche 991 GT3R unexpectedly in the pits with reports of a power steering problem. The Earl Bamber Motorsport crew immediately went to work in the garage to find the cause of the problem, but with 3 hours to go there would be no coming back from this. The race fared better for the number 912 Earl Bamber Motorsport Porsche. Still in the lead and with the fuel strategy likely to pan out, Matt Campbell ended his stint to hand the Porsche over to Dennis Olsen. With new Pirellis fitted on the right-hand side of the car and a full tank of fuel, Olsen resumed the race with 2 and a half hours to go. After the Porsche’s second-to-last pitstop, R-Motorsport cycled back into the lead with Kirchhöfer at the wheel of the Aston Martin Vantage GT3 defending a gap of 6 seconds to the pursuing KCMG Nissan GT-R Edoardo Liberato. The final hours were hard work for BMW Team Schnitzer racers Martin Tomczyk and Chaz Mostert as both drivers were under heavy fire from first the GruppeM Mercedes-AMG GT3 of Maximilian Götz and then the KCMG Nissan GT-R NISMO GT3 of Oliver Jarvis, and the battles wouldn’t let up for Mostert until he finally crossed the finish. As go-time arrived with 2 hours to go, track position became the name of game. Cars that had the speed began pushing forward. Earl Bamber Motorsport’s final pitstop came 76 minutes to the end. Olsen out, Campbell back in, fuel, new tyres and oil added, and away Campbell went, rejoining the race in seventh position. 10 minutes later it was GruppeM’s turn. In an unexpected twist, GruppeM dared to go an extra stint on all four of its tyres, not wasting any time in the pits. A quick refuel was all the yellow Mercedes-AMG GT3 needed. Valuable seconds saved, Marciello raced out of the pits in front of Campbell. R-Motorsport and BMW Team Schnitzer mirrored GruppeM’s fuel-only pitstop and they too left the pits in front of Campbell – the 23-year-old settling in fourth place, 17 seconds behind leader Jake Dennis in the R-Motorsport Aston Martin Vantage GT3. 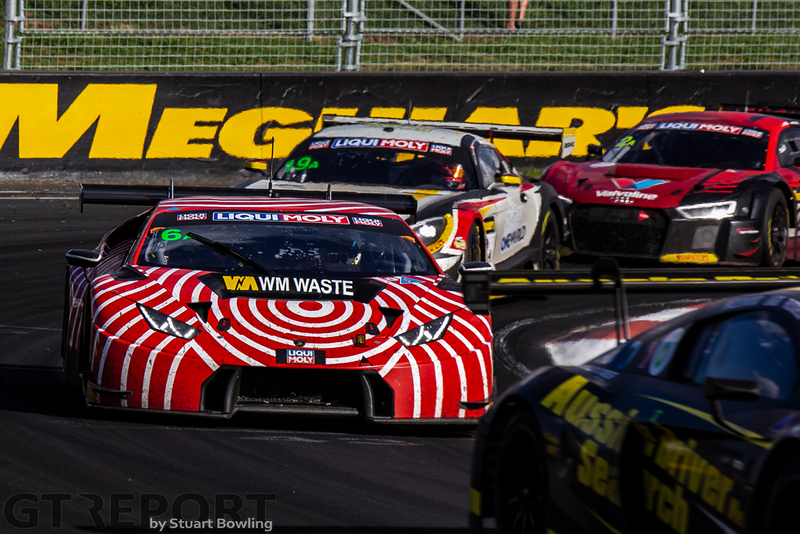 The Vantage was followed in second by Marciello at 7 seconds distance and third-placed Chaz Mostert 16 seconds behind. Soucek, whose number 108 Bentley Team M-Sport Continental GT3 had been a real threat at the front, lost a heap of time and second place behind the Aston Martin when he again accidentally turned off his engine exiting pitlane. The race had been run without a caution for hours when 30 minutes before the chequers the number 50 M Motorsport/Vantage Freight KTM X-Bow GT4 of Tim Macrow broke down on Conrod Straight and trigged a Full Course Yellow. The restart gave new hope to Campbell, who began a dash to the front. At 13 minutes to go he found Jake Dennis and started to pressure the Bathurst rookie. Campbell gave it a few minutes before he squeezed himself through an impossible gap between the wall and Dennis’ Aston Martin at Forrest’s Elbow, miraculously taking the lead. Dennis tried to fight back, but with old versus new tyres this was to no avail. 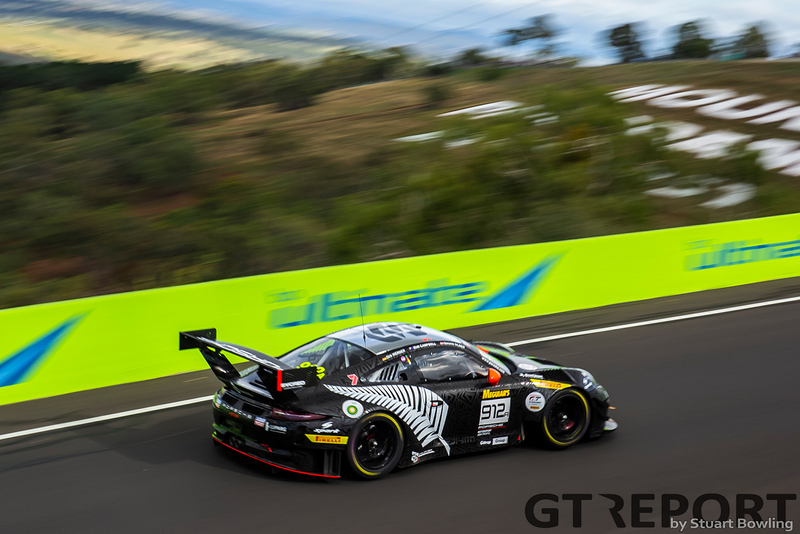 Before long, Campbell shed himself of the Aston Martin and opened a gap to bring home the first Bathurst 12 Hour victory for himself, co-drivers Dennis Olsen and Dirk Werner, Porsche and Earl Bamber Motorsport in a record-breaking 312 laps. Behind the Porsche and Aston Martin a four-way battle for the final podium spot ensued in the closing minutes. 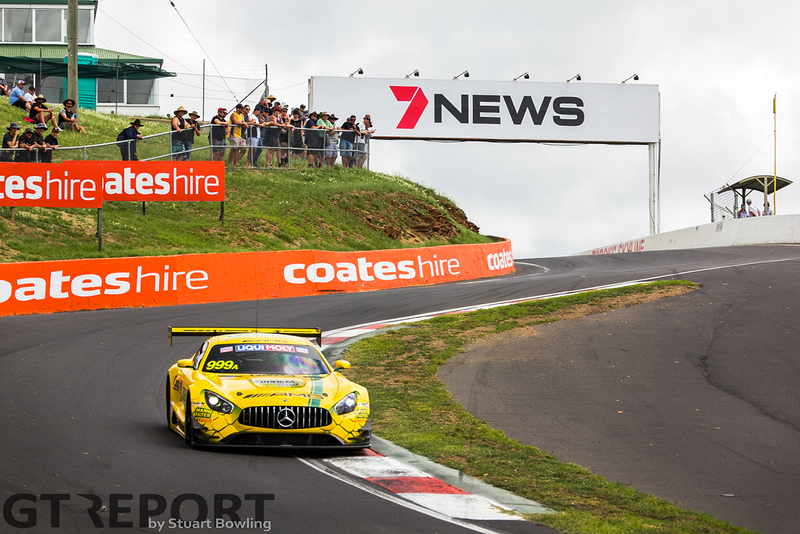 Marciello, racing on triple-stined Pirelli tyres, had to dig deep to fend off the charging Shane van Gisbergen in the fresh rubber-shod Triple Eight Mercedes-AMG GT3, barely beating out Van Gisbergen at the line. In the slipstream of Marciello and Van Gisbergen’s duel, Mostert and Soucek had a fight of their own over fifth, decided at the line in favour of BMW driver Chaz Mostert. The seventh man involved in the lead-lap contenders, Imperatori, had it all fall apart at the final restart when he was caught weaving for which he received a drive-through penalty.